My husband and I arrived in Joseph on a wet evening in late October. 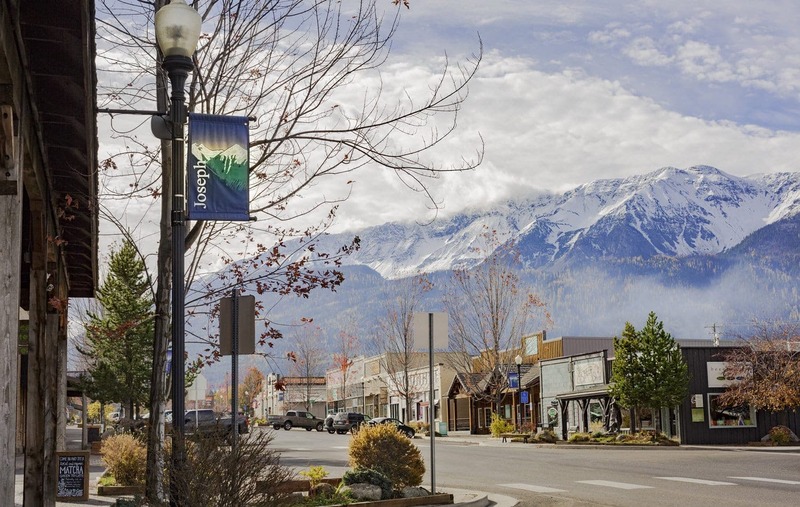 Despite the rain, the drive from Portland grew increasingly beautiful, especially along the Wallowa River from Minam as the fall colors of the deciduous trees along the waters’ banks contrasted against the evergreens at the foot of the Wallowa Mountains, and finally their blue and white snow-capped peaks appeared as we neared the town. Traveling on a budget, we reserved a room at the Mountain View Motel & RV Park, just north of Joseph proper. With a faux log cabin exterior and rooms with themes like the “Red Apple Room,” this place has more character than the average motel. The door to the office was locked, but from the window, I could see a sign on the counter explaining that Scott, the owner, might be in the shower or cutting the grass and to ring the bell or try looking around for him. “It’s an adventure!” the explanation ended. I rang the bell and Scott emerged from a back room, a mustachioed man in camo pants with a very friendly and down-to-earth demeanor. We checked in and went to our room — a small and simple, but clean and charming affair with all the essentials. After dinner in town at Embers Brew House, a small establishment with 17 Pacific Northwest craft beers and ciders on tap, we went next door to the Mt. Joseph Family Foods and picked up some provisions — organic carrots, Franz Bakery bread, Tillamook cheddar, summer sausage and elk jerky, locally smoked by the Joseph Trading Post company. 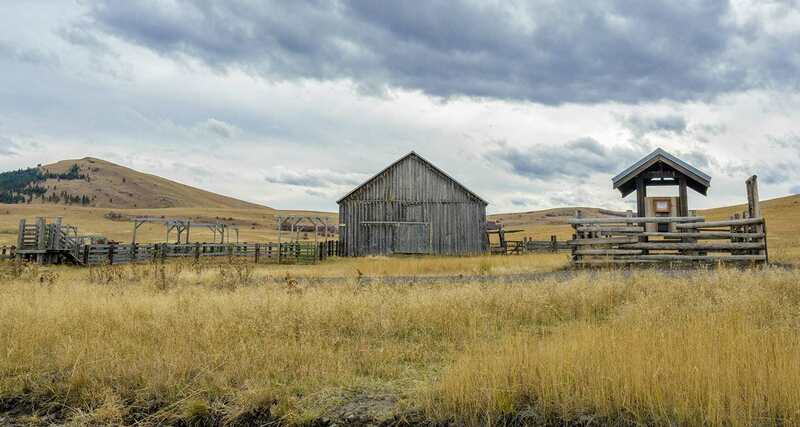 When we arrived back at the motel, I felt ready for what the next day would bring, when our real adventure would begin, and prepared to settle in for the night with my book, The Last Indian War: The Nez Perce Story by Elliott West. 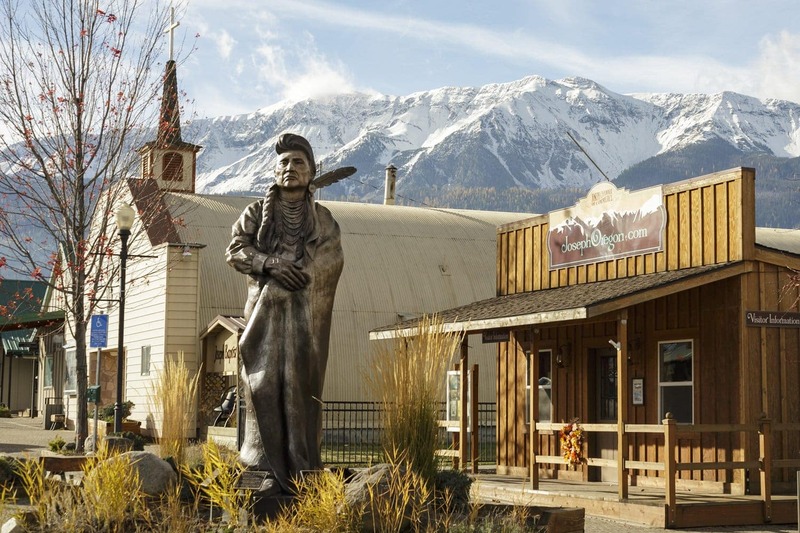 On the cover of the book is a painting that depicts Chief Joseph at the center, just as a statue of him stands at the center of this town that bears his name and Chief Joseph Mountain towers from behind. I had come in search of the Oregon that Chief Joseph, or Hinmuuttu-yalatlat (“Thunder Rolling Down the Mountain”), and his ancestors knew. I was searching for Oregon’s beginning. The next day, we took it a little easy and grabbed breakfast at the Old Town Cafe, a cozy country diner. A friend of ours, Hilary, happened to be working there, and after we ate she sat down with us for a minute to chat. 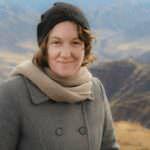 In addition to serving at the café, Hilary also works as an outdoor guide. 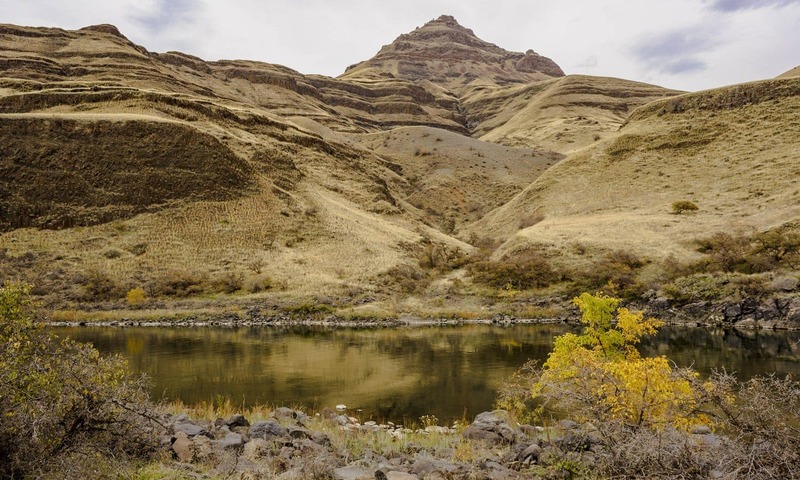 When we told her we planned to hike down the Imnaha River Trail, she advised us to watch out for two things: poison ivy and rattlesnakes. We decided to walk across the street to Joseph Hardware to pick up a snake bite kit, just to be on the safe side. Strolling around town, I ogled some beautiful boots and shoes through the window of the Tempting Teal Boutique, popped into The Sheep Shed and bought some nice yarn from the very helpful proprietor and rounded off the walk by stepping into Arrowhead Chocolates for a cup of the deliciously spicy chai tea that filled their store with a heavenly scent, perfect on a cool fall morning. I also bought some Juniper Ridge Douglas Fir Spring Tips tea from Arrowhead, a canister for myself and one as a gift for a friend. After a lunch of delicious soup and salad at another little house café, Red Horse Coffee Traders, we left town to break in our hiking boots on a short jaunt over to Zumwalt Prairie Preserve. 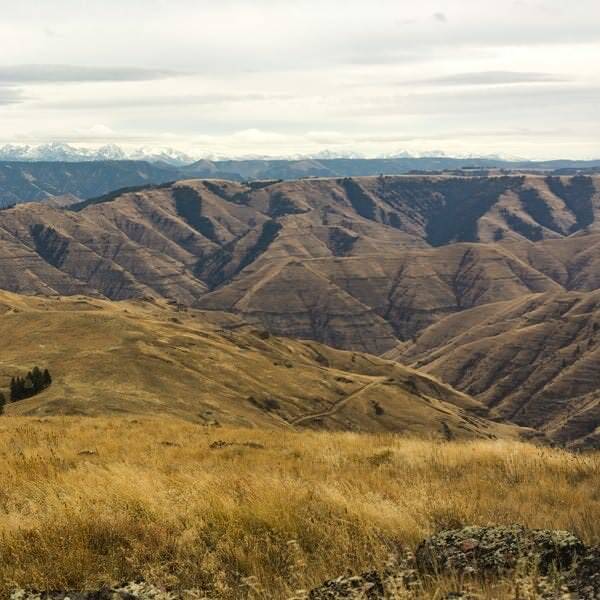 About a half-hour drive northeast of Joseph, the Nature Conservancy has preserved 33,000 acres of this grassland, also using it as a scientific research ground to help ranchers learn how to raise their cattle more sustainably. The expansive prairie has long been a boon to both the wildlife and the people of this area. 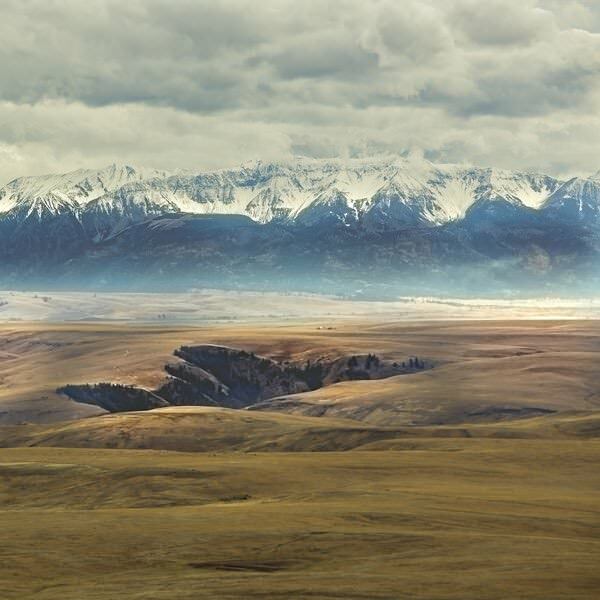 Before the locals raised cattle on its grasses, the native Niimíipuu (“True People,” called by French fur traders Nez Percé) hunted the deer and elk that are still abundant and grazed the horses they were famous for breeding and riding. 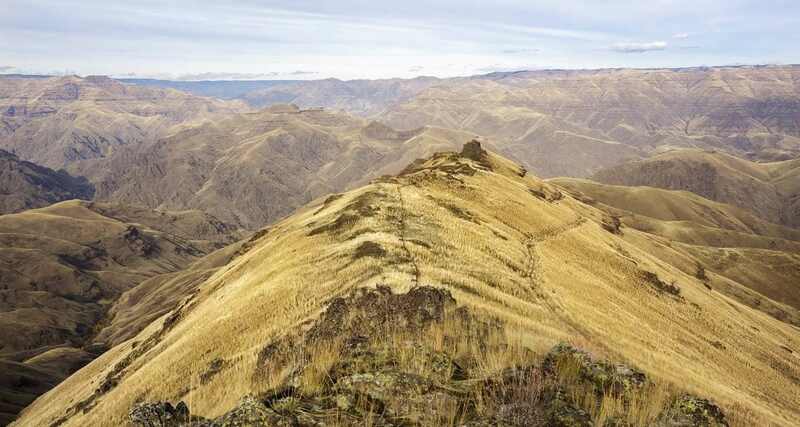 We hiked to the top of a shield volcano on the preserve called Harsin Butte, a strenuous climb, but worth it for the epic views of the prairie, the Wallowas, Hells Canyon and the Seven Devils Mountains in Idaho. Standing at the windswept top, I was reminded of Chief Joseph’s words, “You might as well expect rivers to run backwards as any man born free to be contented penned up.” Anyone born of the immensity, openness and wildness of this place must feel too free to ever willingly be constrained. Like an echo of my thoughts, we began to hear the distant howl of wolves, who have only recently returned to Oregon, wild and free. To my ears, it was a beautiful sound, but we took that as our cue to depart as the sun sank low. 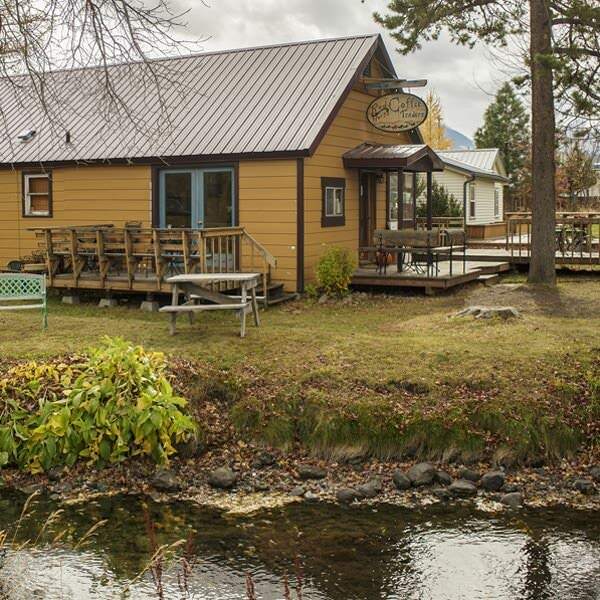 The next day, we left town in the morning, along with swarms of hunters, and drew closer to the place that really brought us to this northeastern corner of Oregon. 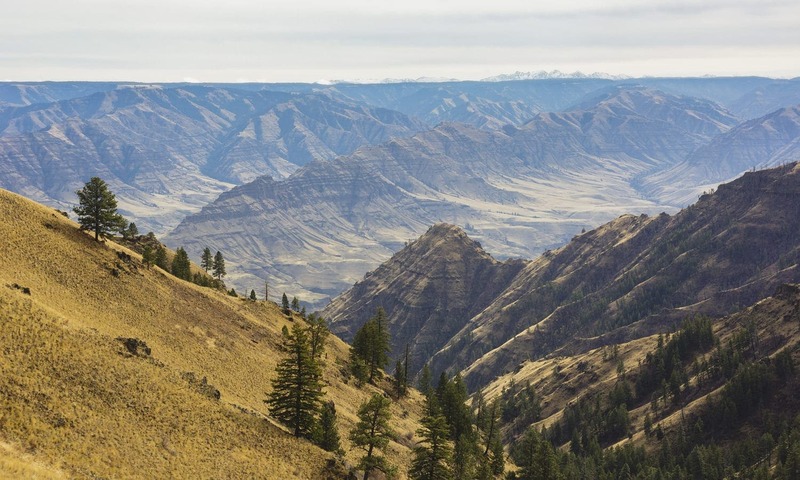 Hells Canyon has been carved out by the Snake River and its tributaries until the oldest terrain that makes up the state has been laid bare — the rocks of the Permian age volcanic islands that were swept against the edge of what is now called Idaho. The collision of the two land masses drove the Seven Devils peaks high into the sky and caused new islands to the west to bubble up from beneath the ocean, becoming the Wallowas. Driving to Buckhorn Overlook and hiking down to Eureka Viewpoint and Spain Saddle, we looked over the Imnaha River canyon until it met the Snake River. The following two days, we planned to hike through the canyon itself. It seemed almost impossible that we could reach the great depths that lay so low beneath us. I thought of the Niimíipuu interpretation of this awesome landscape. Their folklore holds that the Seven Devils were once giant monsters who were eating the people’s children, until Coyote, Fox and other animals worked together to trap them in deep holes of boiling red liquid and turned them to stone. Then Coyote made a deep gash in the earth to prevent other giants from coming over the land. 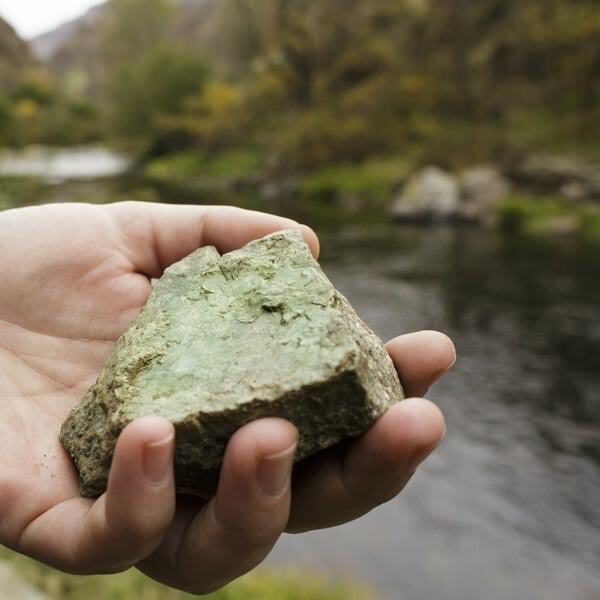 The red liquid hardened to become the copper that can be found in these stones, which, along with gold, eventually brought miners who overran the Niimíipuu’s home. The way down to the viewpoint was easy; the way back up a challenge. By the time we approached the gate on the closed Forest Service road that separated us from our truck, the sun had nearly set. Unsettlingly, the closer we came to the gate, the louder became the moans of what sounded like an angry or injured cow, until we drew in sight of our vehicle — and the horned bull standing next to it. Just as we were pondering how to make it to our truck before the light disappeared, a tall white-haired stranger manifested on the other side of the gate and assured us that the bull wouldn’t charge. We climbed over the barrier and chatted for a bit with our knowledgeable new friend before driving back to town for dinner, frequently slowing as herds of deer and elk grazed by the road. After dinner of a wood-fired pizza with deliciously boozy red wine marinara from the Silver Lake Bistro, my throat became worrisomely sore that evening, and by dawn the next day I knew the virus that had been dogging my husband had finally latched onto me, putting me in no fit state for the long hike along the Imnaha River Trail that we had planned. I rested in the motel and wrote while Eric took pictures around Joseph and Wallowa Lake — probably for the best, to give our muscles a rest, as well as our immune systems. We discovered that our friend Cambria and her family happened to be in the area that day after screening her documentary, Woodsrider, at the Eastern Oregon Film Festival in La Grande. They checked into the Mountain View room next to us and I gave them directions to Buckhorn Overlook and recommended they hike down to Spain Saddle with their little boy the next day. 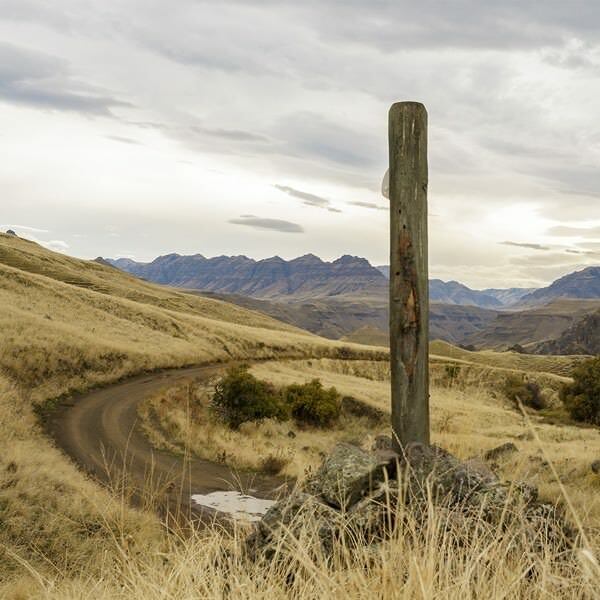 The following morning, we found out that although it isn’t exactly easy to drive to the heart of Hells Canyon, it is possible. 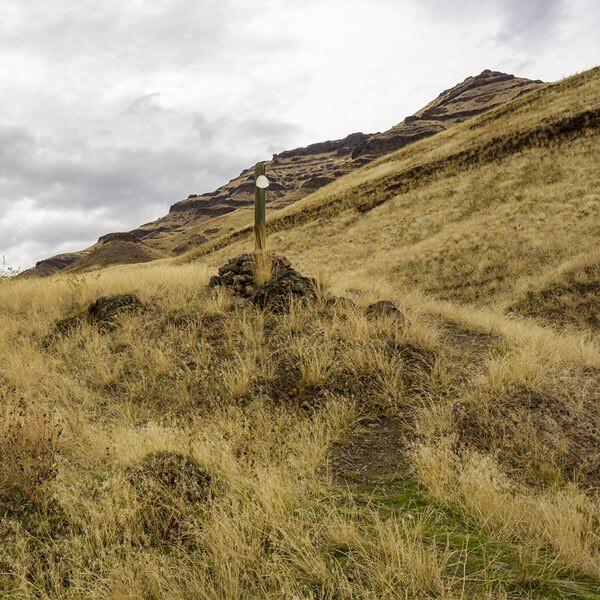 After a slow, bumpy drive with great views, we stopped at the Imnaha River Trailhead and walked a little way to look at the green diorite that is the foundation of the volcanic arc that first became a part of Oregon. 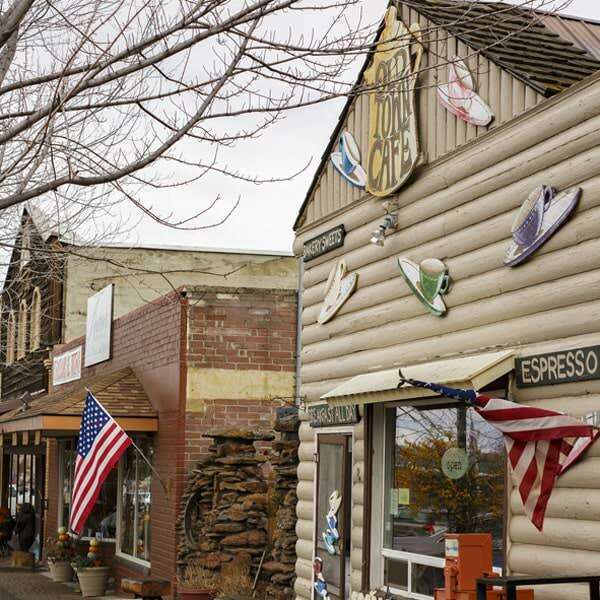 Because of our time lost to my sick day, we couldn’t go far, but the trail leads to Eureka, the remnants of a gold rush town on the confluence of the Imnaha and Snake rivers. 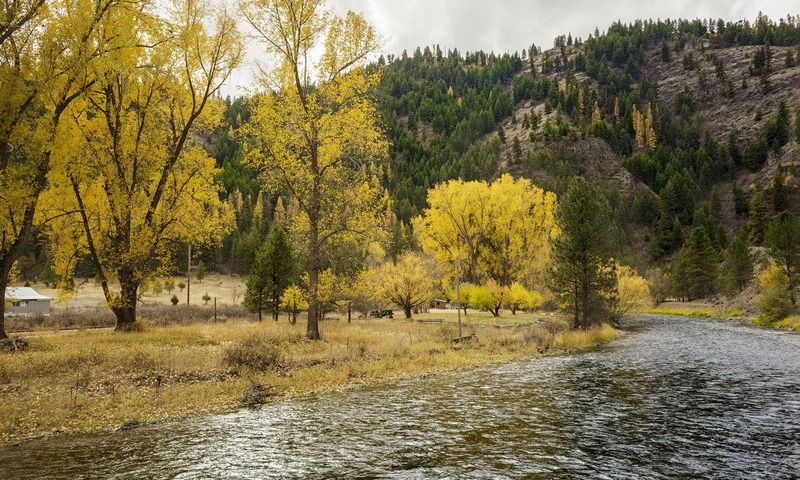 It was the gold rush in this part of Oregon that led to the U.S. forcing the Niimíipuu onto a small reservation in Idaho. Young braves in Chief Joseph’s Wallowa band retaliated by attacking settlers, and the whole band — women, children and the elderly included — fled 1,770 miles towards Canada in a failed attempt to escape the army. Over a thousand of them died during attacks by four different regiments and the arduous journey to northern Montana. We drove the rough road beside the trail through the canyon that the Niimíipuu took to the dangerous crossing over the Snake River at Dug Bar. 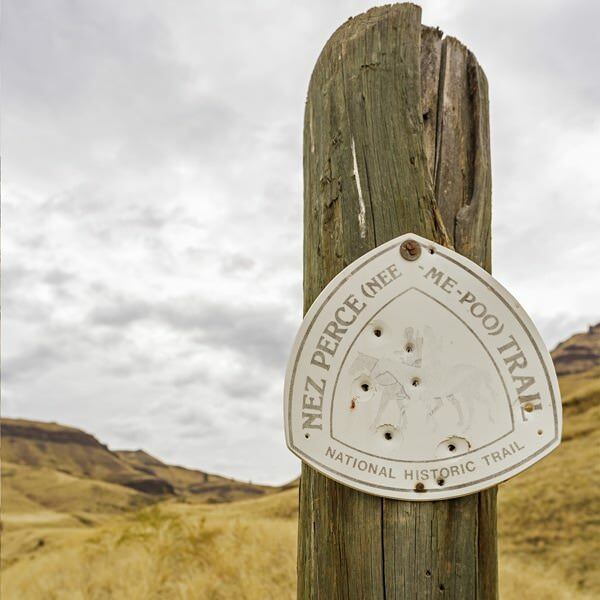 I was too tired from my illness to even hike this steep, but relatively short, section of the Nee-Mee-Poo National Historic Trail, which made the plight of the people who endured the exodus and their suffering seem unimaginable. They were forced to leave in the spring, when the river was at its deepest and strongest, and here in the fall, I would find it daunting to swim across the Snake. 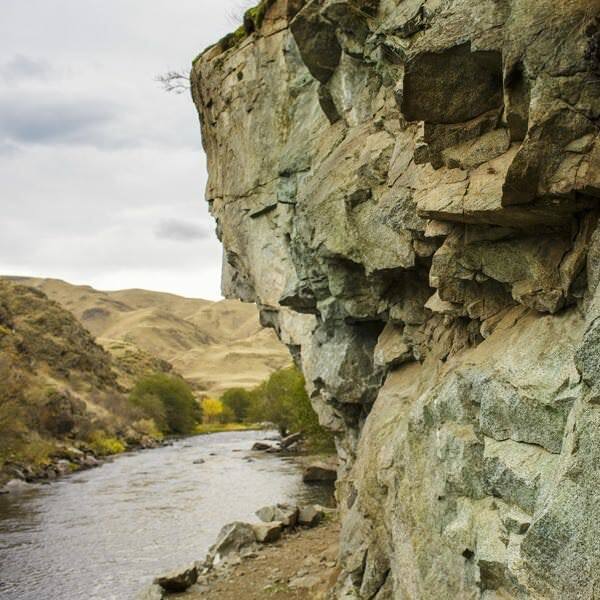 The trail on the other side of the river seemed to resonate with a sad loneliness, as I imagined Chief Joseph and his people disappearing from sight, never to return. 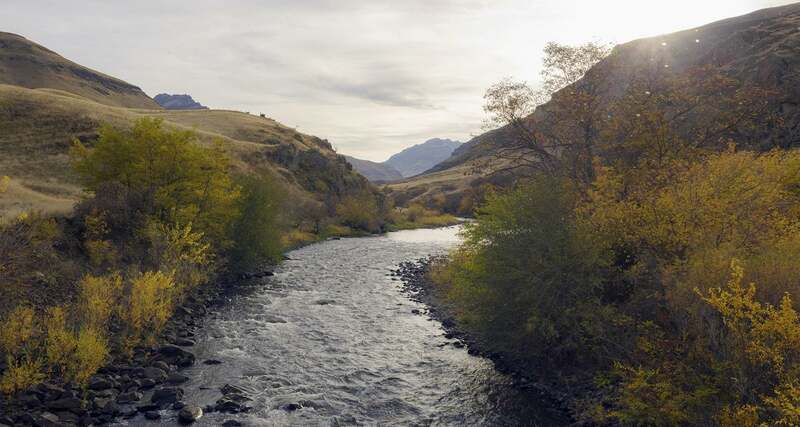 Today, the Niimíipuu have a presence again in the Wallowa area, though their nation’s jurisdiction remains within the bounds of the reservation in Idaho. In Joseph, the Nez Perce Homeland Exhibit in the center of town displays historic photographs of the land’s first people, an extension of the Wallowa Band Nez Perce Trail Interpretive Center, which was organized by the county’s residents and the descendants of the Niimíipuu from Oregon, Washington and Idaho in the 1990s. The True People, to some extent, have returned to Oregon, and their past is warmly remembered and honored — a sign, I hope, that their culture will be further preserved and restored as a part of the beloved place that they and I call home.